As with a number of haematological emergencies, the first sign of a major problem is through a grossly abnormal full blood count. In this case the biomedical scientists made a blood film and confirmed the thrombocytopenia was true. The film was passed onto the haematology registrar who made a morphological and clinical comment. The patient’s main symptom was lethargy and this was why a blood count was done. As there were no other abnormalities in the film apart from hypochromia a diagnosis of ITP was made and the patient was started on steroids. Concomitant iron deficiency due to menorrhagia was suspected and iron replacement was initiated. A bone marrow aspirate or trephine biopsy was not performed. A week later her platelet count had increased and after a further week her steroids were weaned. Reduced survival: Immune mediated (ITP, HIT, drugs (penicillin, antiepileptics), HIV, autoimmune diseases (rheumatoid, SLE, antiphospholipid syndrome), sarcoid, NAIT, post transfusion purpura), non-immune (DIC, sepsis, TTP, malaria, HUS, endocarditis, pregnancy-related (HELLP, pre-eclampsia), thrombosis, metallic valve, intra-aortic balloon pump), hypersplenism (sickle, alcohol, liver failure, malaria, lymphoma, EBV/viral, Felty’s syndrome, myelofibrosis, amyloid). Investigations are targeted by the history and examination whist bearing in mind the above causes. This disease is different in adults and children and the disease in adults is discussed here. This is an acquired autoimmune disorder; the full aetiology of which is poorly understood. It may occur following viral infection, in the context of autoimmune disorder or in a lymphoproliferative disease. Many patients complain of lethargy, bruising or a petechial rash. Major bleeding is rarely a complication. Treatment is not usually indicated in platelet counts above 50. Corticosteroids – usually 1mg/kg of prednisolone is the standard first line treatment. Advice re side effects is given and a proton pump inhibitor is prescribed. Osteoporosis prevention may be needed if steroids are given long-term. Pulsed dexamethasone is also given. If steroids cannot be weaned a sparing agent such as azathioprin can be used. Second and third line treatments include rituximab, splenectomy, thrombopoietin agonists. In emergencies intravenous immunoglobulin, platelet transfusions, supportive measures, high dose steroids and tranexamic acid can be used. 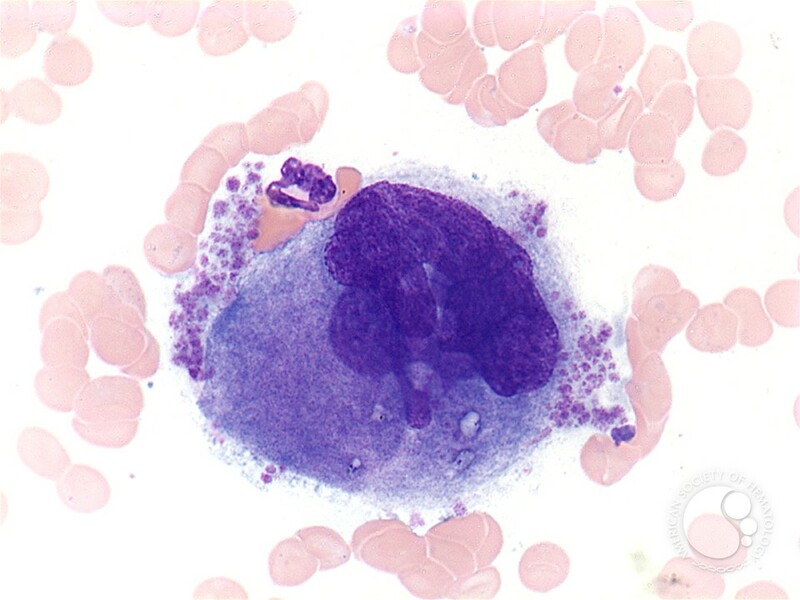 This entry was posted in Laboratory morphology, Platelet disorders and tagged Bone marrow, ITP, megakaryocyte, thrombocytopenia. Bookmark the permalink.